When experiencing a problem with your Wabash Mutual Telephone service, there are several troubleshooting steps you can try below. If the following steps do not help to repair your service, please contact Wabash 24/7 at 419.942.1111, and we will be happy to assist you further. If all the services you’re subscribed to are not working, check at the protector outside your home for a dial tone. Refer to the instructions under No Dial Tone/Check Outside Your Home. Verify all phones are properly hung up. Verify you have power to all phones and bases, inclduing battery power on cordless handsets. Check for any noticeable line damage. Unplug all phones, modems, and answering machines from their jacks. One by one, plug each device in and check for a dial tone. 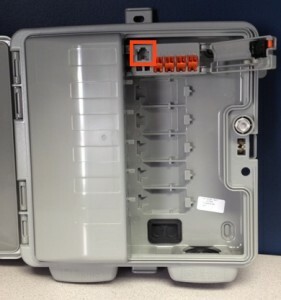 One bad device can cause no dial tone on working devices until removed or unhooked. 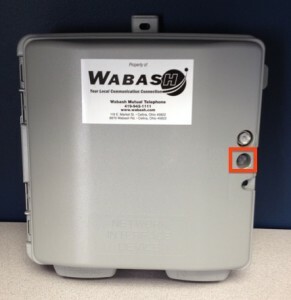 Locate the Wabash protector on the exterior of your home. Using a flat head screwdriver, loosen the bottom screw to open the unit. Plug your corded phone into the jack in the module and listen for dial tone. If a dial tone is present, make a test call. If the call goes through from the protector, then the problem is most likely in the house, either with a phone/device or interior wiring. You may try to identify the problem yourself or contact Wabash. If no dial tone is present, contact Wabash. Once testing is complete, close the module and the protector, remembering to tighten the screw back up. Follow the steps for No Dial Tone, and have someone make a test call to you while you’re at the protector. Follow the steps for No Dial Tone. If noise is present at the protector, please contact us. If you experience a problem with a calling feature, please consult the Calling Features Manual. If you still have questions, please contact us. The most common recording is due to the dialed number being invalid, in which case, you should verify the number you are calling and try again. When calling long distance, verify that 1 has been dialed in front of the number. If the number has been dialed correctly, and you still receive an error, contact us and let us know the exact recording you are receiving.